What does a typical day in Bangalore feel like? One can’t help but think of the traffic, the potholes, the never-ending garbage crisis and the rampant corruption. But there are lovely things about the city too – the trees, the lakes, the melting pot of people from all over, the weather, the work culture… the list is endless. 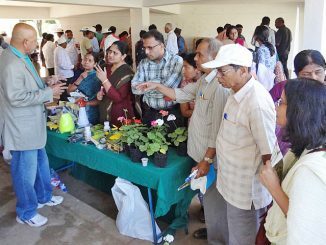 For many old-timers, as well as folks migrating to the city, Bangalore seems to be a near-perfect city. Bangalore is also the state capital, and houses most of the administrative wing of the state. It also has its own municipality – the BBMP. Can you imagine what a day in the like of an official would be like? Director Venkat Bharadwaj looks to answer this question with his upcoming film ‘A Day in the City.’ The film follows a day in the life of an efficient government officer in Bangalore, and what he does to convince the powers-that-be, so as to get them to do the right thing in the interest of citizens’ safety. Bharadwaj says, “The movie is not only applicable to Bangalore. Apply the story to any other city in India and the plot will still seem relevant”. Bharadwaj, who during the course of the week, is the Regional Sales and Marketing Head for IT products at StarCom, becomes a filmmaker on weekends. While he has made music videos and short films in the past, a feature film is something that has been on the cards for a while now. Some of his previous work include a music video on water conservation (Paani ke Rang) and a short film on education (Polish). ‘Of the people, by the people, for the people’ would be an apt phrase to describe Bharadwaj’s venture. Most members of the crew and the cast are primarily IT folks. Friends and friends of friends auditioned for the role, and the film was shot over weekends. Bharadwaj says, “Most of us had day jobs, so the only time we had to shoot was over the weekends. We’d begin shooting at 7 am and wrap up by 9 pm. It was certainly a busy time for everybody involved”. For Bharadwaj who has been at the helm of all the action, it has been even busier. He adds, “I’d work like a donkey on weekdays and a super-donkey on weekends. The past five months have been very hectic”. Though the movie is yet to release, while talking to Bharadwaj, one can sense he has some things down pat. He says, “Irrespective of the technique that is used to make a movie, the message that it conveys should be crisp. I believe the screenplay is core and is what makes the storyline very strong”. He says that he spent more than six months researching before he started working on the script in September. He adds that his is a different kind of movie. Each character in the film is a hero. The film itself is a thriller – one that will keep the audience on the edge of their seats. The story unfolds itself as a series of events, almost like the domino effect, where one incident filips a chain of events. Bharadwaj adds that the audience should watch out for the cinematography, especially for the underwater shots. A Day in the City releases in the third week of July. 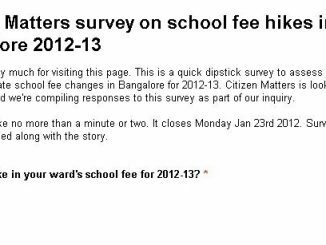 Citizen Matters is doing a quick dipstick survey to assess trends regarding private school fee changes in Bangalore for 2012-13.